We’ve all got a favorite flavor pairing. Peanut butter and chocolate. Raspberries and chocolate. Coffee and chocolate. Wait, how did chocolate make its way into all those examples?! Oops. How about mango and cardamom? Pumpkin and cinnamon? And my sleeper favorite, butternut squash and sage. There’s something transcendent about that combination, but I don’t use it often enough. Every time I do, though, I’m reminded how lovely sage is—it has such a pure, clean scent, and it complements butternut squash like a dream. I think you’ll agree when you try this dish. In a large pot, heat the olive oil over medium heat. Add the onion and cook for 4-6 minutes until translucent. Add the rice and stir so that the rice is coated with the oil and onion mixture. Add the wine and it let it cook for a minute or two, then add a cup of the vegetable broth. Stir frequently and add more broth as the rice soaks it up. The entire cooking process should take between 20 and 30 minutes; you might not use all the broth and that’s okay. Taste the rice as it begins to soften to test whether it’s done. Towards the end of the cooking process, add the nutritional yeast and spices. Turn off the heat and mash in the squash. Stir in the vegan butter (if using) and add salt and pepper to taste. 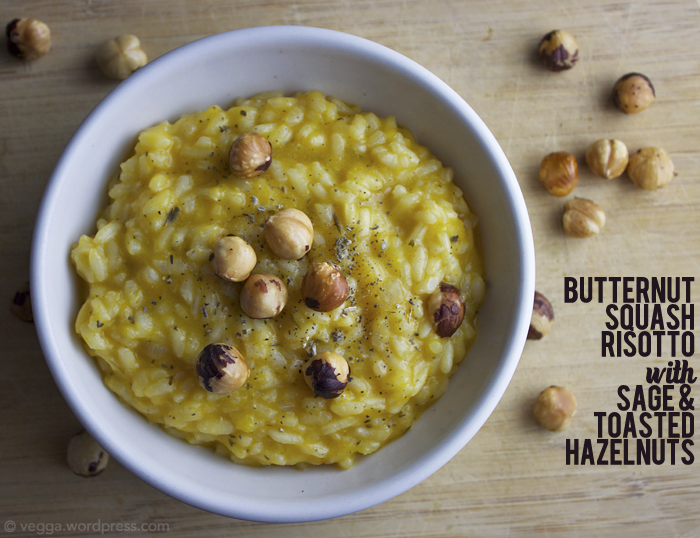 Top with toasted hazelnuts and serve. This beautiful dish is just perfect for fall. Each serving offers modest amounts of protein, iron, and calcium, but this dish is just bursting with vitamin A thanks to the squash. According to the NIH, vitamin A “helps form and maintain healthy skin, teeth, skeletal and soft tissue, mucus membranes, and skin.” (1) It also helps produce pigments in the retina. 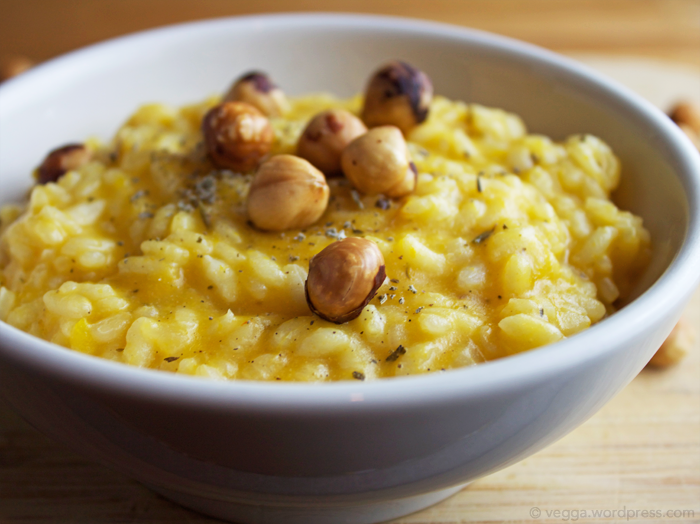 Vitamin A is fairly simple to obtain in your daily diet; a serving of this risotto offers more than 100% of your daily needs. Orange and yellow fruits and veggies are high in beta carotene, which the body can convert into vitamin A. And now that it’s pumpkin season, I bet we’ll all be taking in lots of vitamin A! What are your favorite flavor pairings? This looks/sounds wonderful! I love sage too, and it sounds dreamy with squash.